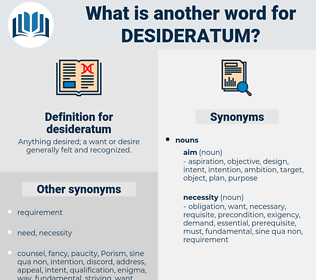 What is another word for desideratum? 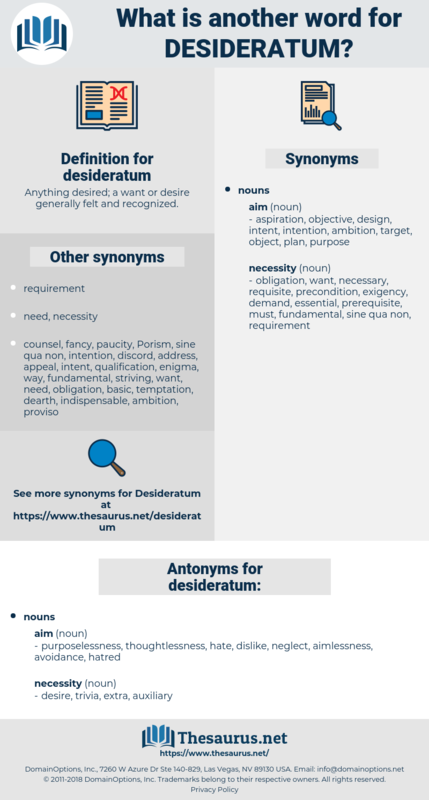 Anything desired; a want or desire generally felt and recognized. purposelessness, thoughtlessness, hate, dislike, neglect, aimlessness, avoidance, hatred. riches, wealth, luxury, have, plenty, comfort, fortune, nonessential. To effect this desideratum, therefore, they toast the grain to blackness, boil it to bitterness, and then drink scalding stuff of the consistency of water - gruel. That's the grand desideratum of my wishes. essential, necessary, requisite, requirement, necessity.